Say You just unpacked Your new 1911. How would You go about adjusting the rear sight for Your match load? up 8 clicks an check at 25 yards up 6 more for 50 yards and go home. You already have a match load? Shoot it and see where they hit. Put up a huge white piece of paper, doesn't need to be a target, but make it big. 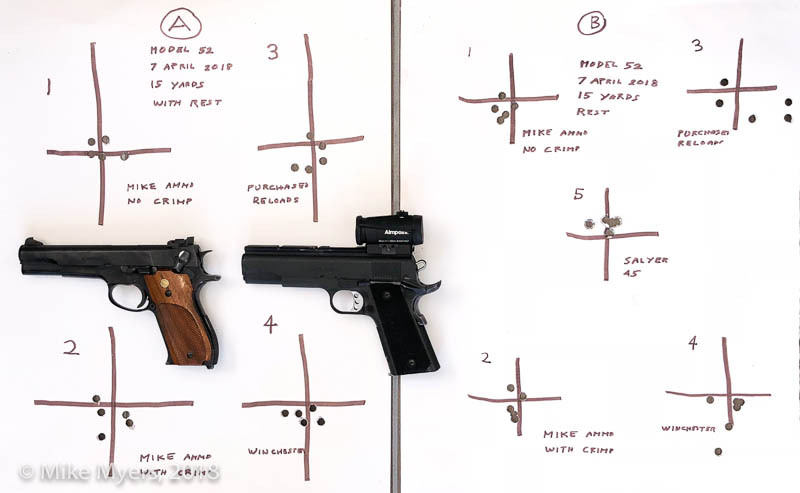 Draw a cross with a magic marker, shoot 10 rounds, with gun resting on some kind of rest, and judge where the middle of the holes is, in relation to the cross you drew. If the holes are 12 inches away, no big deal - that's why you have that big piece of paper to start with. Then you can draw more crosses, but leave space between them as needed. Start at the top left cross, and work with the sight adjustments. Mark the crosses so you know which one you shot at first, second, and so on. If the holes move away from the center of the cross, you're turning the wrong way. Write down on a piece of paper everything you do to adjust the sights. Everything. And what effect it had. When you lose track of what's what, or after you make a change, move on to the next cross. Sorry, I didn't save any of the early sheets, but this is all you need to do to get your sights working better. Oh yeah, do it at 10 or 15 yards. Oh, I forgot. When you're done, take a photo of it and post the photo here. 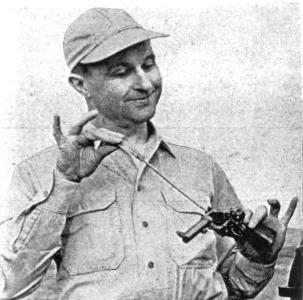 Added later - when you have things reasonably adjusted, try this while holding the gun in your hands, no rest. Jack H wrote: You already have a match load? What Jack said. I have seen where no adjustment was needed to where the "heck" did that go? "If you want that boomerang to come back then first you have to throw it". Probably showed my age there..
Sheriff1962 wrote: Say You just unpacked Your new 1911. How would You go about adjusting the rear sight for Your match load? The problem with this thread, is that when I got my first 1911 (Colt Combat Commander) back in the early 1980's, I had no idea how to adjust the sights, let alone the more complicated things. My "match load" was what my friend told me to do with my RCBS Big Max Press. Maybe we could have a "newcomers" forum here, for threads such as this, and move them there if someone didn't know to do it originally. .....and before I joined these forums, I had no idea what a "match load" was either. I still say things that aren't worded properly. Next time I sight in a gun (usually happens after I remove the sights, then re-mount them) I'll take a photo of my "target", and write the things I scribbled on my notebook onto the target. I would have posted that, if I has taken a photo. If it were a new gun to myself I would bench rest it and test a couple of different proven loads I have for my other guns first. I can’t expect my match load for one gun to shoot in every gun. I’d use those loads as a starting point. I would test it on a large sheet of paper at 50 yards. Before taking shots for group measurement I’ll take a couple of shots and see how far off from center it is. I’ll make several big adjustments first if needed just to bring the impact closer to center mass. Once it’s close enough - and not spot on, but just in neighborhood of a bullseye target - then I’ll put up a target. I’ll start shooting for groups. Once I’ve found something I like, I’ll start shooting slow fire strings with it like normal. No more bench resting. I sight the gun in for how I shoot and not off a bench. So I’ll take three or so shots and if I felt good about them I may make an adjustment based on those few shots. I may make an adjustment based off the very first shot if it felt right and wasn’t at least near what I called. And I’ll continue this way until I’m taking 10 shots that I feel relatively confident about and judging the position of a much larger amount of shots instead. By that point I may not make anymore adjustments save maybe one or two clicks in some direction if need be - and if so I’ll shoot another 10 to verify. But that’s pretty much it for me. If I think to do it before I go to the range I use a laser boresighter I adjust the irons until the laser dot is on top of the front sight. If I have an optic I merge the dots. Load development, bench or Ransom Rest. I usually start with my normal target load & load it down & up in 0.1gr increments and test the results. For me, when I put up a target, my mind gets "serious". I want the holes in the middle. When I put up crude crosses, I am much more relaxed, I'm just curious where the group will be. Even better than crosses is a sheet of white paper, no markings. If I was going to be serious, I completely agree with you. Again, just for me, if I have no idea what the group will be like (such as my black powder gun, that I would be shooting tomorrow if Miami wasn't getting flooded), I'm going to put up a huge piece of white paper with a cross in the middle, and set it up at 15 yards. I guess I'm just being lazy, but when I'm getting reasonable results at 15, I'll move it out to 25. I have never yet tried to work up a load. I've followed the recommendations from Terry at Magnus, which match the recommendations in this forum. I imagine if I was going to do that, I'd do what you guys are describing. A rough cross would be too crude to be useful. Here is a sight in process for ya. First shot went off good. But was way out at 8 in the 5 or 6. I confidently cranked in some up and right. Second shot went off good. It was closer at about 10 in the 7. (funny how we remember things like this fairly well) I took out some of the up and added a little more right. Third shot went off good. A 9 at 9 almost a 10. Tiny bit more right and finished the target fairly well. Roddy had done a pretty good job on the trigger. Sorry , I put quesiton the wrong way . Do You adjust Your sights shooting off the bench ? Or the way You shoot off hand. Sometimes I zero off the bench and when I pick it up it shoots high or low. Some guns , shoot the same off the bench and off hand. Difference of bench verses offhand zero is all about the difference in your technique off the bench verses offhand. Same issue applies when during a match your point of impact starts to shift, it's because your hand might swell a little or your muscles get fatigued, etc.... and the point of impact might move/shift 1/2 a ring or more. I notice this in air pistol the most, which means I probably need to work on stamina. The best advice I got early on in Air Pistol was, "Hey those sights are adjustable for a reason! ", I was still in a set 'em and forget 'em mindset. Sheriff1962 wrote: Sorry , I put quesiton the wrong way . Do You adjust Your sights shooting off the bench ? Or the way You shoot off hand. Sometimes I zero off the bench and when I pick it up it shoots high or low. Some guns , shoot the same off the bench and off hand. Strictly IMHO, but for me it's offhand only, no exceptions. First, I use a laser boresighter just to bring the sights to the area so that I can see my hits on paper. Then I check my natural point of aim, take my usual stance and start shooting offhand, watching the sights or the dot, calling the shots and making adjustments in process. Once my hits start grouping around the X (and hitting X occasionally ) and most shots are called, I know I zeroed my gun. And it won't necessarily hold the same zero always, I zeroed my .22 before Perry this year and it was dead center, but at Perry I had to make some windage adjustments, if I'm not mistaken, five clicks to the left.